This wine comes from the Veneto region, in the north-east of Italy. It is made by the Pieropan family, who have been making wines for over a century. They still own and run the business. The vineyard is in an area of stony, calcareous hills, which create excellent conditions for the vines. The Pieropan family are hugely well-regarded wine producers. They have been very innovative throughout their history, being among the first winemakers in the area to label a wine ‘soave’, back in the 1930s. They were also one of the first in the Veneto to use a screwcap. They are still innovating today, which is why they are still producing such great wines in a changing environment. Wines and the wine industry evolve over time, and things change—I think this is an example of a wine that has managed that evolution very well. This is a very expressive white wine. The first taste is like a sparkle in your mouth. It is the freshest and youngest wine the family produce. I discovered it in a restaurant here in the UK back in 2011. The vintage I had was fresh and had good intensity, with flavours like citrus, pear and mandarin that your palate really enjoys. There was also a lovely nutty base and crisp texture. I remember thinking how beautifully balanced it was. Soave Classico is made from a blend of two grapes from the family’s estate. One is garganega, which can be richly textured with concentrated aromas of honey, candied lemon peel, tropical fruits and sweet spices. The other is soave trebbiano, which is high in acidity with a moderate alcohol content. This brings the dry and crisp texture to the wine, but with a fresh and fruity flavour and that nutty base. There is a wonderfully complex combination of aromas that really enhance the drinking experience. Over time there has been an evolution of the wine towards a honey sweetness, but they have managed to keep the mouthfeel and refreshing character. 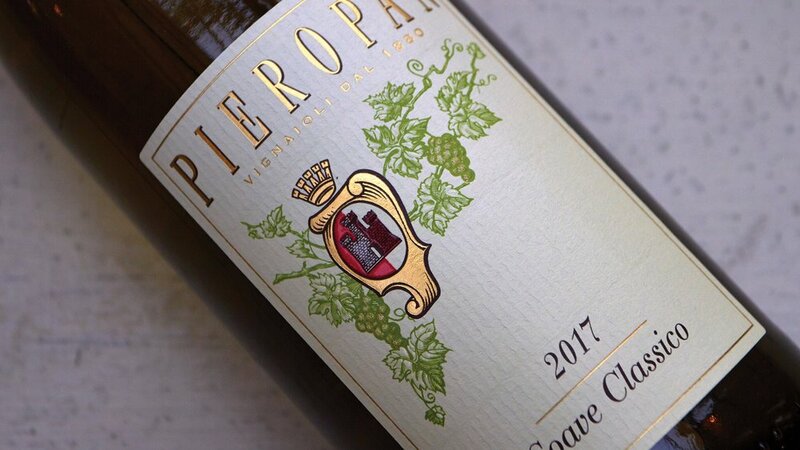 Though they have modernised and moved forward over the years, you can taste the common thread through the different vintages of Pieropan Soave Classico. While it has evolved, it is definitely the same wine that I loved when I first tasted it. I am a big believer in the fact that there are no ‘wines for food’ or ‘not for food’. This wine will work beautifully with white fish, shellfish, vegetables like asparagus, and even with white meat like chicken. But it is also wonderful to have on its own, on a warm spring afternoon with friends. During a hot summer like the one we had last year, this definitely becomes one of my favourite wine choices, either out or at home. At Aubaine, we have recently reduced our wine list, making it much shorter and really concentrating on offering well-made wines that are great examples of their kind. This is a very high-quality wine that sits within that ethos.